John Magufuli - From Compromise Candidate to 'Petty Dictator'? Angellah Kairuki, the first woman in the country’s history to lead the mining docket. The two new ministries come hardly a month after experts in the mining sector, including Prof Abulkarim Mruma, proposed the splitting of the Ministry of Energy and Minerals into two full-fledged portfolios. With the split of the Ministry of Agriculture, Livestock and Fisheries into two, the total number of ministries has reached 21, up from the previous 19. The newly created dockets are Livestock and Fisheries and Minerals. In the major reshuffle, two ministers and one deputy have been dropped, bringing in a single new face and promoting five deputies to full ministers. The axed are Gerson Lwenge who headed the Ministry of Water and Irrigation and Natural Resources, Tourism's Prof Jumanne Maghembe and Anastazia Wambura from the Ministry of Information, Culture, Arts and Sports. Dr Magufuli has appointed George Mkuchika as Minister of State, President's Office, Public Service Management and Good Governance, taking over from Angellah Kairuki who has been transferred to the Ministry of Minerals. The promoted deputy ministers with their portfolios in brackets are Seleman Jafo (Regional Administration and Local Governments), Merdadi Kalemani (Energy) and Isack Kamwelwe (Water and Irrigation). Dr Hamis Kigwangalla (Health) and Luhaga Mpina (Environment) have been promoted and transferred to the Ministries of Natural Resources and Tourism and Ministry of Livestock and Fisheries, respectively. President Magufuli also brought in 14 new faces as deputy ministers. They are George Kakunda and Joseph Kandege (Regional Administration and Local Governments), Kangi Lugola (Union Affairs and Environment), Stella Ikupa (Policy, Parliamentary Affairs, Labour, Employment, Youth and the Disabled), Mary Mwanjelwa (Agriculture), Abdallah Ulega (Livestock and Fisheries) and Elias Kwandikwa (Works, Transport and Communication). Others are Subira Mgalu (Energy), Stanslaus Nyongo (Minerals) and Josephat Hasunga (Natural Resources and Tourism), Juliana Shonza (Information, Culture, Arts and Sports), Jumaa Aweso (Water and Irrigation), Faustine Ndugulile (Health, Community Development, Gender, Elderly and Children) and Atashasta Nditiye (Works, Transport and Communication). Mr William Ole Nasha who served as deputy Minister for Agriculture, Livestock and Fisheries has been moved to the Ministry of Education, Science and Technology, taking over from Eng Stella Manyanya who is now deputy minister for Industry, Trade and Investment. 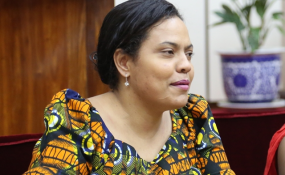 Ministers who retained their positions are Jenista Mhagama (Parliamentary Affairs, Labour, Employment, Youth and the Disabled), January Makamba (Union Affairs and Environment), Charles Tizeba (Agriculture), Makame Mbarawa (Works, Transport and Communication), Philip Mpango (Finance and Planning), Palamagamba Kabudi (Constitution and Legal Affairs), Augustine Mahiga (Foreign Affairs and East African Cooperation) and Hussein Mwinyi (Defence and National Service). Others are Mwigulu Nchemba (Home Affairs), William Lukuvi (Lands, Housing and Human Settlements Development), Charles Mwijage (Industry, Trade and Investment), Joyce Ndalichako (Education, Science, Technology and Vocational Training), Ummy Mwalimu (Health, Community Development, Gender, Elderly and Children) and Harrison Mwakyembe (Information, Culture, Arts and Sports). Deputy Minister who have retained their ranks are Anthony Mavunde (Parliamentary Affairs, Labour, Employment, Youth and the Disabled), Ashatu Kijaji (Finance and Planning), Susan Kolimba (Foreign Affairs and East African Cooperation), Hamad Masauni (Home Affairs) and Angelina Mabula (Lands, Housing and Human Settlements Development).